It’s not a secret that we love the AR-15 around here. That said, there are some things the AR-15 just can’t do. Namely, the AR-15 can’t handle “long-action” cartridges…so there’s a limit on the power or distance you can get out of a round fired from an AR-15. So if you’re looking at getting AR-10…look no further! We’re looking at the best complete rifles here. Don’t worry, we’ll be doing articles on the Best AR-10 Uppers and Best AR-10 Lowers for all you builders out there who want something a little more custom. I want to get this out of the way up front: I’m a big Aero Precision fan. 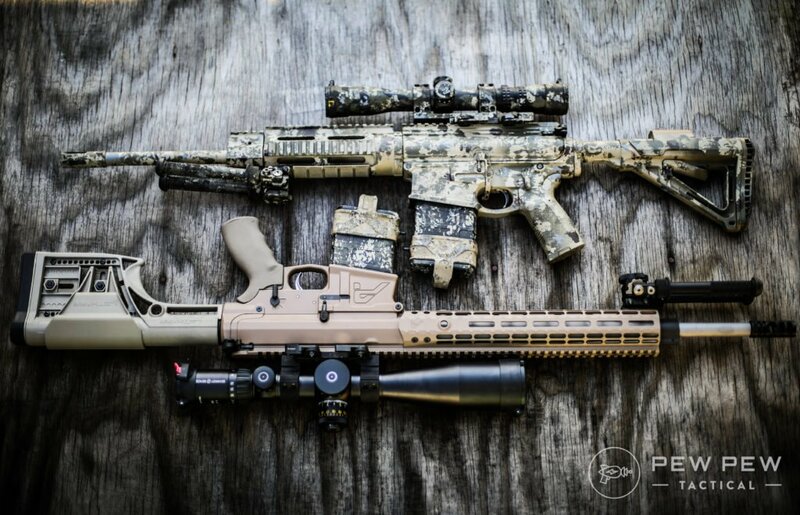 They’re known in the industry as one of the biggest quality manufacturers of lowers and uppers for other AR makers. They also offer a wide variety of build kits, including various Cerakote options that are available as limited runs. How much do I love these guys? Well, I have three rifles built on their lowers, including my favorite hunting rifle and one of my competition guns, and I have two of their upper and lower sets sitting on my bench begging to be turned into something awesome. And I paid for all of them with my own money. So, all that out of the way, what about the Aero M5E1? 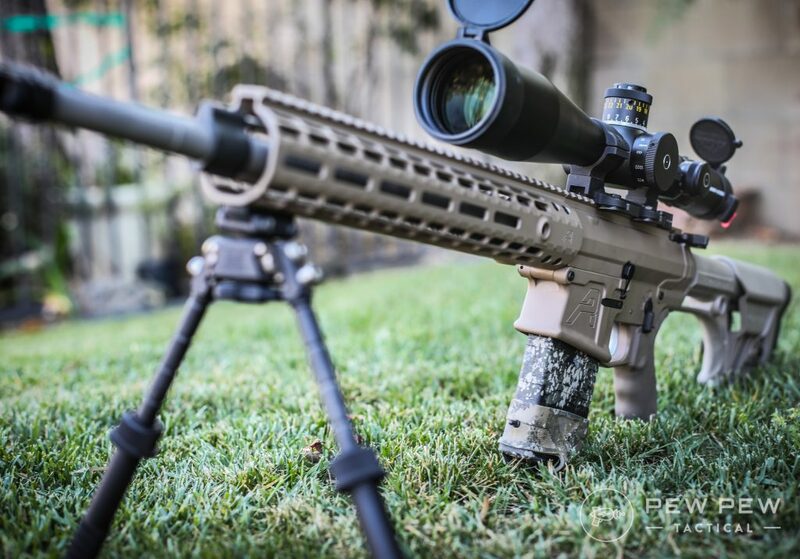 Why does it make it on my list of the best AR-10s? I’m glad you asked, friend. The Aero Precision M5E1 Complete Rifle is built with Aero’s excellent Enhanced Upper and M5E1 Lower, both of which are available for purchase separately, and often available together if you want to get them both for a build. Well, it has to be said that the groups that Eric originally got out of the gun when he tested it a couple months ago were less than impressive. But then he started using better ammo. As you can see, the top recommendations were the ones tested, and Eric shot between 1.5 and 2 MOA, which is perfectly respectable for a <$2k .308 rifle with factory ammo. With handloads, Eric and I both believe the gun is capable of around 1 MOA to Sub-MOA accuracy. If you’ve done any real research into AR-10s, you’ve come across the name DPMS. DPMS has become one of the standards when it comes to AR-10s, to the point where there are two big “types” of AR-10 out there, Armalite (which is a bit proprietary and we’ll get to in a minute) and DPMS, which is more or less a scaled up AR-15. The big split can kind of be looked at like the difference between say, commercial and mil-spec parts. Mostly, you just need to know which parts you have so many new parts you get work with what’s already sitting around (or strewn across your workbench). Fortunately, because of the parts compatibility between the DPMS version of the AR-10 and more common AR-15’s, you won’t struggle as much to find parts, which is always a plus in my book. So, I have a confession. I’ve only shot a DPMS AR-10 once. HOWEVER, my good friend John Bern who has about 30 years more time on the AR platform than I do owns three of them and regularly harvests hogs, deer, bighorn sheep, and other larger game with it. Take that for what it’s worth. 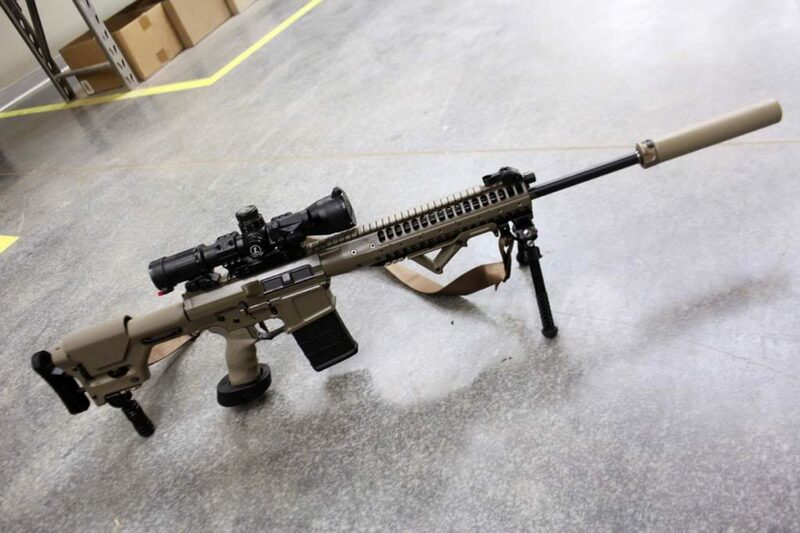 My own time behind the rifle was spent thinking that it cost about a grand more than it did, and it definitely punched above its weight class accuracy wise, with sub-moa groups at 400 yards with handloads. Eugene Stoner is known by many as the progenitor of the AR-15/M16/M4 design that has so captivated gun owners and militaries the world over. Slightly less well-known is his first creation, the Armalite AR-10. Like I said in the beginning, this was the original rifle that competed with what would become the m14 for a spot as the US military’s main battle rifle prior to the Vietnam War. It was this design that Stoner would eventually scale down to the AR-15 we know today, which was bought by the Air Force, and 10 bazillion or so ARs later, would go on to rival Kalashnikov’s creations for the title of “most popular rifle ever”. If you will accept no imitations, no pretenders, and want only the purest, most original AR-10, you’re in luck. Armalite still makes the AR-10 that put them on the map, and despite shutting down for a bit in the 80’s and being sold and bought out a few times here and there, they still make some awesome guns. Well, I shot one of these over a long weekend at a friend’s ranch and had no problem hitting Coke cans full of Tannerite at well over a quarter of a mile. Granted, that was with a very nice piece of glass (this one, if memory serves) and some handloads worked up by the gun’s owner, but still. I put around one hundred rounds through the gun, and the only failure came from a piece of cheapo ammo that didn’t want to go off, even after being run through three different guns that had otherwise not seen any issues. Okay, first of all, it’s pronounced “Reaper” which is either cool, or a little too “edgy teenager with dark eyeliner” depending on your perspective. For me, the name is whatever. I’ve carried Kimber 1911’s that were named by a marketing committee in the throes of a tense word-association game gone horribly wrong. I’ve carried the insanely inspirationally named Glock 19. The name has never once caused a gun to perform better or worse. What matters, as the infomercials will tell you, is one simple question: will it blend? Well, in this case, it will absolutely blend. Or shoot. It’s a weird metaphor, just go with it. LWRCi originally created the first version of the R.E.P.R. for the military’s CSASS (Compact Semi-Automatic Sniper System) competition. While they lost that contract to H&K, they certainly didn’t do poorly. The LWRCi R.E.P.R MKII is an updated version of that rifle and is built to the same exacting standards as the already awesome first version. The main difference between that version and the MKII is the gas system. The new gas system is adjustable to 20 different positions as opposed to the suppressed and unsuppressed settings of the first R.E.P.R’s gas block. Oh, my sweet baby Jesus in a manger. This is one of my favorite guns, and heaven help me (and hold me to this guys) I will own one. 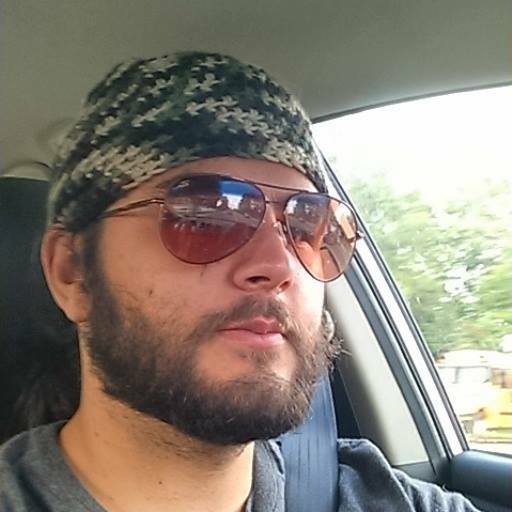 I was very fortunate in that I got to shoot one at a range day event hosted by a local gun shop. I was given five rounds of Federal Gold Medal Match 175gr. I put those five rounds into a one-inch circle at 200 yards. For those of you playing along at home, that’s a half MOA performance out of a gun I’d never shot before. Honestly, I suspected shenanigans. This was a media gun that had already been shot by others (who ended up doing similar things with it). They wanted me to go away and tell people about this gun, so obviously it was going to be tuned and running like a champ, right? Well, it turns out that every freaking one of these rifles shot that way. Just ask the guys over at The Firearms Blog, who got very similar results out of the gun they tested. So, I want this gun, but I don’t want you to want this gun because they might be sold out when I finally scrounged up the money for one. We recently told you guys how much we like the Glock slides from Grey Ghost Precision, and I, your humble gun blogger, neglected to tell you about the Grey Ghost Precision Specter Heavy .308 rifle. This thing is made with all the same love, and care, and incredible engineering precision as Grey Ghost’s other offerings, and it shoots like a dream. I got to shoot one, and I was struck by how much the rifle handled and felt like my 3-Gun rifle, which is a much smaller, lighter, softer recoiling 5.56 gun. It comes with a number of high-end features like a nice bull barrel with a sweet target crown on it. Sub-MOA accuracy is expected out of guns like this, but what I did not expect was the overwhelming reliability that other authors and gun nuts like me have seen from the gun. In particular, Nathan Murr got to shoot the gun when it was dirty, nasty, and filthy, and it still performed like a champ (he also echoed my impression of the gun shooting softly and handling like a smaller, lighter rifle). I saved this one for last for a reason. I know many of you are going to see that price tag and your immediate thought is going to be swearing, probably some variation of “Hellllll no.” If you’re one of those people just stay with me for a minute. Daniel Defense makes good stuff, that shouldn’t be news to you. They hold a number of military contracts, and with good reason. Their guns shoot, they shoot well, and they shoot every time. I’ve been to their Georgia facility before to take a look at the engineering that goes into these guns, and I gained a whole new level of appreciation for the work that goes into building say, a $3000 AR. Like a freaking dream. I’ve killed deer with it. I’ve rung the gong at 800 meters with it. I’ve put half a mag in a half inch hole at 100 yards. I’ve never had a problem with this gun, and I never expect to. If you’re looking to use this gun for competition, hunting, or even home defense, the gun will do its part if you do yours. One thing I will say, particularly about this gun and the LWRCi one: you get what you pay for. With some guns, you don’t, and when it comes to expensive guns like this, that price tag gets harder to justify the bigger it gets. All of these guns made this list because they are worth the money. Brownells has got you covered with their BRN-10 in .308 that revives Eugene Stoner’s battle rifle used in 1955-1960. I haven’t had the chance to shoot this bad boy yet but it felt great in-hand at SHOT show. Love the trigger charging handle under the carry handle. Probably the most affordable one on this list…and that’s because from raw materials to final product…PSA does it all in-house. Great reputation and my buddy swears by his. A lot of the times PSA’s complete rifles are out of stock. But since AR-10’s are also pretty modular…you can buy a complete upper and complete lower. It sometimes even saves you some money and give you more control over furniture options. And for uppers…I’m a fan of going stainless 18″ to wring out some extra accuracy and velocity of the bigger rounds. Make sure you get a combo WITH bolt carrier group (BCG) and charging handle (CH) included. The mil-spec trigger will be a little gritty like all of them out there…and would be the first thing to swap out. But otherwise, it will run reliably and shoot decent groups. Truly the best bang-for-the-buck in the AR-10 world…if it ever stays in stock long enough! I’ve had the pleasure to shoot two AR-10 offerings from PSA. The more common one is the .308 version (full review here) which shot great. Check out the review for videos of me hitting 600 yards with ease. And also the AR-10 in 6.5 Creedmoor which will stay supersonic to 1200 yards…and still pack a punch further than that. 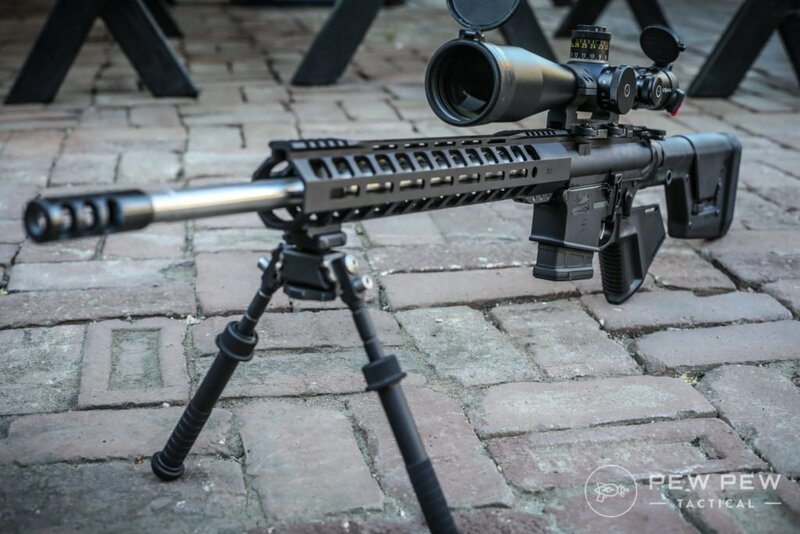 Full review of PSA’s 6.5 Creedmoor. 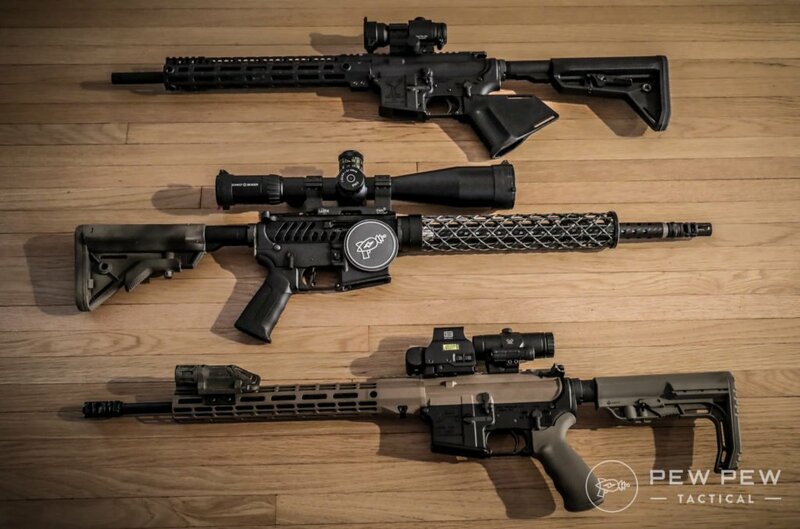 What’s your take on the PSA line of AR-10s? All in all, I love the AR-10. It’s a sometimes-finicky rifle that, when done well, can be one of the greatest joys to shoot, and one of the most versatile options in your gun safe. These guns are the best of the best in their particular niches and are perfect if you find yourself needing to hit something very far away with a very large bullet. Check out more of our favorite guns & gear in our Editor’s Picks…or how about the Best AR-15’s. Really surprised that the POF (which is the same size as an AR15) didn’t make your list. I can accept that you can only do so many, but it’s really pretty unique. #1. 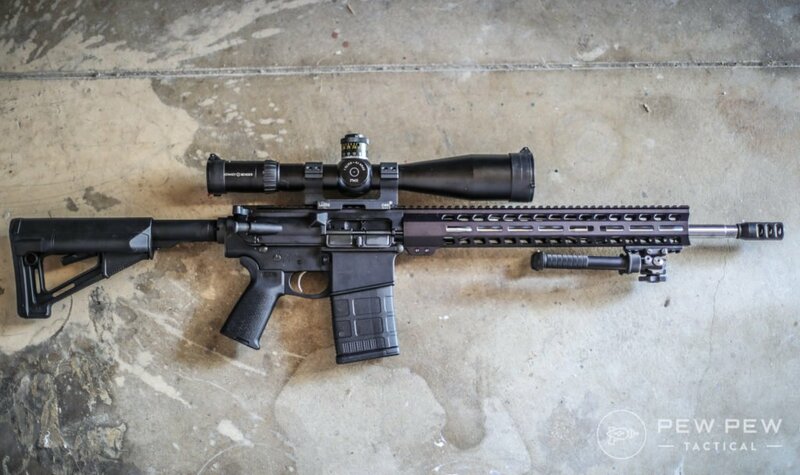 LaRue Tactical OBR. The only rifle on your list that’s even close is the LWRC…and it’s only close.